The SSI Open Water Diver course gives you the skills and certification you need to become an independent diver. Once you complete this course, you can plan and execute your own dives, (always with a dive buddy, but you won't need an instructor) up to 18 metres or 60 feet. The 3-day SSI Open Water Diver course includes a theory and pool session, with a total of 4 open water dives, in Tulamben and Padang Bai. You'll be provided with beverages, snacks, lunch, and transport from your hotel to the dive centre and back, as well as all the equipment you need to complete your course. This is a great way to spend three days out on the water, exploring some of the best dive sites in Bali. NOTE: To pass this level, you will be expected to swim 200 metres and float for 10 minutes in open water. Your 3-day SSI Open Water Diver course in Bali lets you explore some of the best dive sites in Bali. You'll do your theory and pool session on day 1 at the dive centre in Sanur. After that, you'll head out in a boat to Tulamben or Padang Bai, depending on weather and tide conditions. These spots are where some of the best snorkelling and scuba diving takes place. 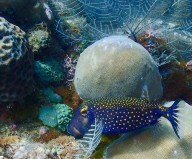 You'll find plenty to see, with the coral reefs teeming with a variety of fish and shrimp. If you're lucky, you'll spot turtles, octopuses, or even the harmless blacktip reef shark. • Become a certified SSI Open Water Diver in 3 days. • Enjoy 4 dives in Tulamben or Padang Bai. • Learn the skills you need to become an autonomous diver. • Spend three days on the water, enjoying the tropical paradise of Bali. For cancellations made more than 2 days before the start of the SSI Open Water Diver course: 50% of the trip cost will be refunded, minus any transaction charges. For any cancellations made 0-2 days before the departure of the SSI Open Water Diver course: No refund. Eat a good breakfast before your pick up arrives at 07:00 hrs. You'll be driven to the dive centre and here, you'll fill in some paperwork before you begin your course. You'll start with the theory and pool session to cover the basic skills. There are fun exercises to complete, and then you'll test your gear in the pool. This will help you get used to the equipment and ease into the process of breathing underwater. Your day ends by 16:00 hrs and you have the rest of the evening free to explore Bali. Eat breakfast before you're picked up from your hotel and driven to the dive centre. It's dive day and you'll head out in a boat to either Tulamben or Padang Bai, depending on the weather and tide conditions. You'll enjoy a dive in open water, and will practise some of the skills you learned in the pool out here. You'll break for lunch and head out on one more dive. After that, you'll return to the dive centre to revise the theory and fill in your log book. You'll be dropped off at your hotel after this. The rest of the day is yours to spend as you please. Eat breakfast before your pick up arrives at 07:00 hrs. You'll be driven to the dive centre to refresh your theory for the skills you'll practise today. After that, you head out for your dives. You'll undertake 2 more dives in the gorgeous blue waters, complete your underwater tasks, and learn how to dive to a depth of 18 metres or 60 feet. You'll break for lunch in between. By the end of the day, you'll head back to the dive centre to complete a written test, and fill in your log book. Congratulations, you're now a certified SSI Open Water Diver, with the license to dive up to 18 meters, anywhere in the world. You'll be dropped off at your hotel, and your trip ends here.